Product from Mace isn’t as easily available in the states as it should be. They make a some solid product, and it is very reasonably priced. Yet another import from our Canadian friends from the north, I’ve been beating on a full kit for the last year. I’m happy to report that their gear has been holding up well. I’m particularly impressed with the knee pads- with a few tweaks, these pads would shine. I’ve taken hits on them that would shredded similar models from 661. (both my TomCat and Strait pads are currently in the “sew me back together” box in the back of my closet) While this post focuses on the armor and gloves, I’ve also been wearing a few jerseys they make, as well as the shorts, and they are solid numbers as well. Orginally published on MBAction.com. Check out the full review here. 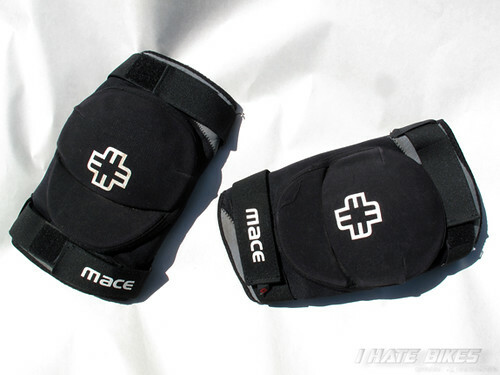 Mace designates the Drone Knee Pads as dirt jump specific, but they also match the current style of light weight knee protection favored by many in the DH race scene. They’re comfortable pads that combined with an extremely reasonable MSRP of $39, deserve a closer look. Similar in design to models from 661, Troy Lee and Race Face, the Drone shares a slip-over design that is supposed to be low profile. 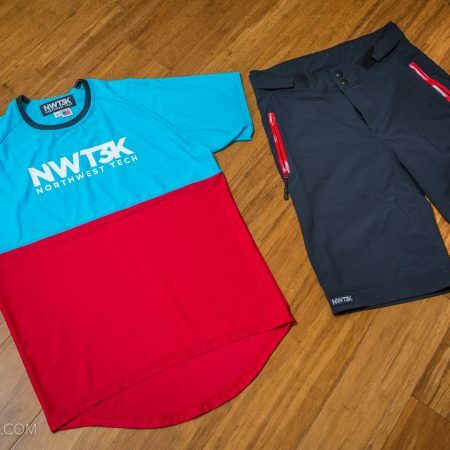 While they are not as slender as other models, we managed to fit them underneath standard sized jeans and even a pair of Carharts for street riding and sessions at the dirt jumps. That said, if you take to wearing girl’s jeans, you may be disappointed. Personally I never had issues with snagging or fit underneath shorts while riding and barely noticed them- a good sign. The Drone knee guards have a unique look to them- the plastic molded cups are fairly wide, and stick out a bit to the side. The knee cups have a bit of concave to the shaping, but and don’t wrap around nearly as much as similar models from other manufacturers. As an experiment, we left them out in the sun, then bent and shaped them by hand; it seems to help a little bit, and lowered the profile some. Other point of interest is that the cups are sewn in as two pieces: one covering the knee cap, and the other slightly below it. The second cup is shaped like a half moon, likely to facilitate bending at the knee joint. Constructed with an airprene wrapped shell over injection molded plastic cups, we found the Drone pads to have adequate ventilation in comparison to other models. Even after full days on the bike they were comfortable, and they worked well on all mountain rides as well, without any sore spots or rubbing. I’ve had issues with 661 pads chafing the inside of my knee where I have a bit of scar tissue built up; that problem wasn’t experienced with the Drones initially. (updated) After a full season of use I’m starting to notice a little of this. I am starting to think I should replace my knee armor on a yearly basis at least- I hit the ground often enough that I am more than getting my full investment out of them. With a retail price of $39, that seems like a reasonable value proposition. 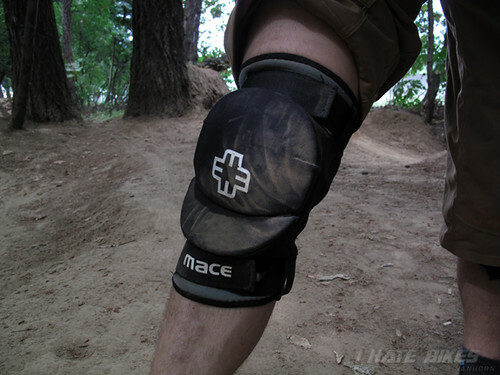 For the next generation, I would recommend Mace revise the mold of the knee cups, for a more streamlined fit. That said, with the low MSRP and the quality construction, they ended up a nice set of knee guards for the money, and a good option for someone that wants a guard with a bit of a different look. Other than the white branding of the logo, the color aesthetic is fairly neutral- it would be nice to see a version with a darker, more subdued graphic for riders that don’t want that “billboard” look. Originally published on MBAction.com. Words by JVH, pictures by JVH and Inga. 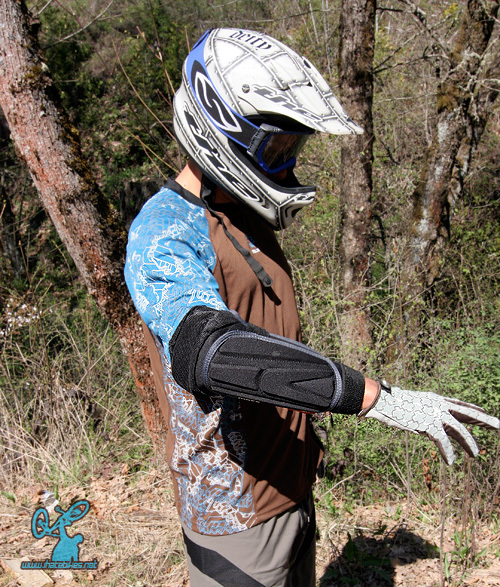 When I first tried the Mace AMX Arm guards on, I was not a fan.The design of these elbow pads are a throwback to the early days of the freeride revolution, when having a 4 inch travel fork identified you as a freerider. How we laughed when we passed our friends still riding their blown out Judy forks. 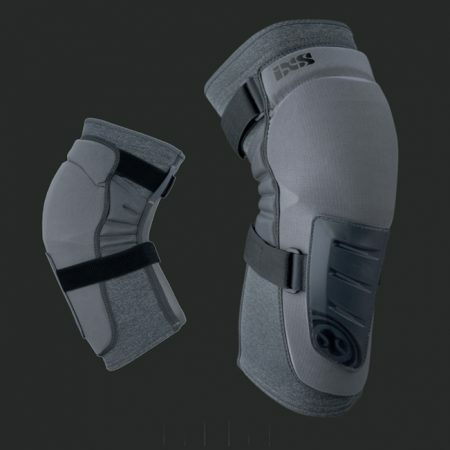 Similar in design and construction to the classic Roach elbow and shin guards, they are offer light protection against any impacts you may encounter. The AMX guards are aimed at all mountain riders into the classic fit and designs. Constructed using hard plastic wrapped in kevlar, they use elastic webbing to hold them in place. Unlike many of the current crop of molded plastic cups, the plates in the guards aren’t molded, and instead bend around your elbow, aided by the cross over hook and loop straps. We weren’t crazy about the form of the guards as the velcro caught on our sleeves, and the non-stream lined design didn’t work with 3/4 length jerseys. Our initial thought on the guards were that they weren’t very comfortable.This sentiment was echoed by everyone that tried them on and wore them on a ride. Personally, when I’m riding terrain that dictates the use of elbow protection, I generally just step it up to a full protective jacket. 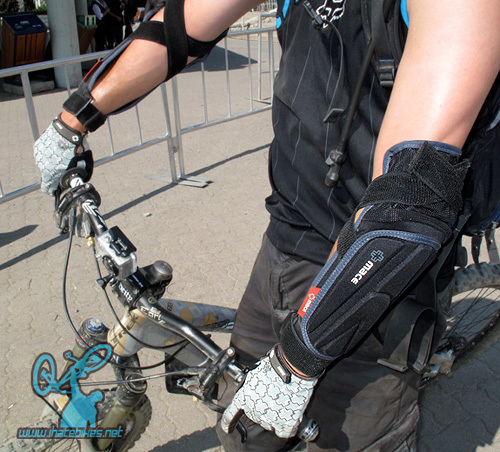 However, in some trails where clearance is tight, its nice to have a bit of elbow protection. We did find a scenario where they made sense and worked. 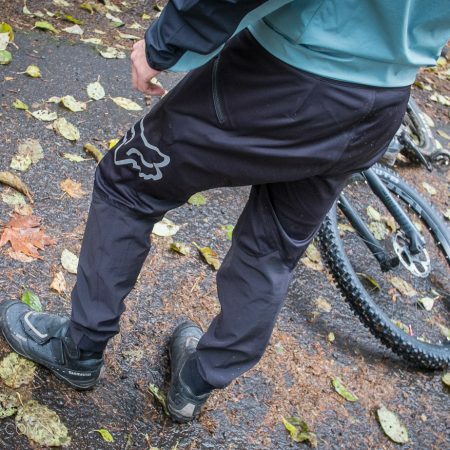 Once the weather got cold, fitting these guards over a long sleeve jersey or jacket offered us with an additional layer of warmth, and when we were banging through the trees on slightly icy soil, we were glad we had them on. Wearing a layer underneath them eliminated our comfort issue, and the flat shape of the guards meant they fit in our packs when not in use. They don’t have a lot of bulk and are fairly lightweight. We ended up donning these pads when we wanted some protection on rides with lots of pedaling in frigid temperatures. Because the loose, strap over design, these pads worked when some of the other ones would have been less than ideal. If you ride in these conditions, they might just work for you. 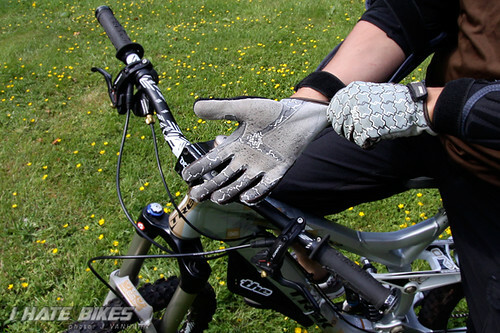 Mace bills the Foundation Glove as a dirt jump glove, but we found it great for every application we used it for. As a light weight glove, it was comfortable whether we were riding our favorite all mountain trail, racing downhill at Sea Otter, or boosting the hits on Dirt Merchant in Whistler. 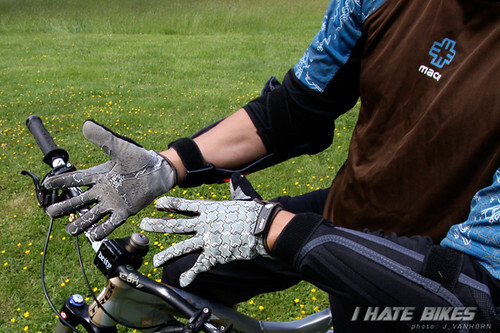 Used as a DH glove, it lacks adequate knuckle protection for that application, (assuming you ride somewhere with a lot of tight corridors & trees) but then again that isn’t the intended use. 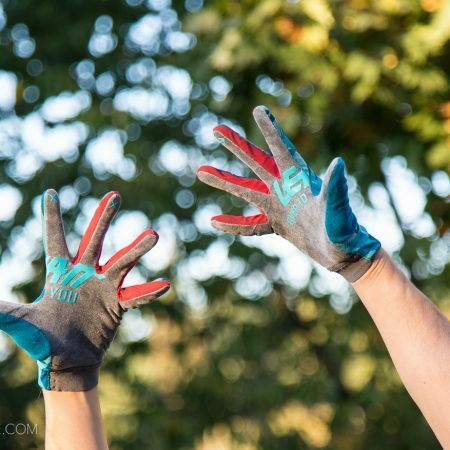 It does live up to what we expected- whether we were shoveling dirt on the local jumps, lopping branches while doing trail work, or riding, it protected our hands in comfort and style. In fact, the only drawback is the white and gray color gets dirty quickly. It hasn’t been a deal breaker by any means, as the gloves have held up well after numerous machine washings. The graphics of the fashion print go really well with my personal bike, which is always a nice bonus. Glove fit is always a personal thing, as some of us have longer or wider fingers, but the Foundation Glove fit me well, and has become my go-to glove of choice. The Velcro closure strap is in exactly the right place, on the top part of the palm, and never came undone. My favorite feature though, is the extended material on the palm: (which I wish more gloves would have) it offers a spot to tug the glove on, similar to a lot of skate shoes. The extended palm material, constructed of an Amara synthetic leather, is thin enough to feel in tune with trail feed back through your grips, but should last a long time without ripping- a problem I’ve had in the past with many gloves durability-wise. The terry on the thumbs was a welcome and often used feature as well, especially while swinging tools on hot days and prepping jumps for a session. At a suggested retail price of only $27.00 they are worth checking out.